Perhaps surprising given the fresh ingredient orientation of Japan’s cuisine, sauces play a hugely important role in Japanese cooking and are used extensively to make foods and dishes richer, more interesting, and more enjoyable. At the core are Japan’s foundational sauces. Dashi, a clear stock made from katsuobushi (dried smoked fish) and kombu seaweed, is the “soul” of Japanese cooking. It is a savory essence of the sea, so transparent and respectful of the other ingredients that you hardly know it is present in almost every dish, providing an ethereal, integrating liquid base and also a primordial reminder of where all life came from. Sake is another essence, that of the country’s rice fields and many sources of pure, fresh water, used as much as a stock as a way to relax and make yourself happy. Sweet, shimmering mirin and sour, aromatic rice vinegar are sake’s offspring, used to make a range of sweet and acidic sauces. The concentrated sauces include soy sauce, the “heart” of Japanese cooking, and its large family of derived sauces. They supply delicious proteins to foods and boost their flavors with savory vitality. Miso is another type of concentrated sauce made from beans and grains, which is used as is or transformed into savory and sweet compound sauces that add luscious textures and mouthfeel to dishes. Lastly, there are the sauces made from purees of seeds, nuts, vegetables, and fruits that add aromas, colors, and complementing and contrasting flavors to foods. The art with which sauces are made and used in Japan rivals that of the famously sauce-oriented cuisine of France, but this tends to be overlooked because of several subtle and not so subtle differences. The most obvious difference is that Japan’s classical sauces are not stocks, broths, and reductions of red meat juices. Nor do they traditionally include the lingering pleasures of animal fats, like butter and cream. Instead, they have traditionally been based on the lighter, but no less rich and satisfying, ingredients of seafood and vegetables. Their richness comes from the ingenious ways they combine and multiply the impact of various sources of umami to create super-umami. (For example, the glutamate acids in kombu interact with the inosinate acids in katsuobushi to make dashi an intensely rich stock.) Japan’s sauces are also umami-enriched by being fermented or containing fermented ingredients. More subtle differences are the ways sauces are made and used in Japan. Japan’s traditional sauces and families of sauces are built around the primary seasonings of salt, acid, umami, and sweetness, and their primary role is to deepen and broaden the other ingredients’ own intrinsic flavors rather than make a dish more interesting by adding new flavor. They may include accents of herbs, spices, and heat but are firmly grounded in the role of enhancing and harmonizing the flavors of a dish. In addition, Japan’s traditional sauces don’t assert themselves by a thick consistency that layers foods; instead they are delicate backdrops or have a light body. Fullness of mouth and lingering flavor come from additions of umami to dishes. This reluctance to layer foods is reflected in how sauces are used. The cook presents relatively straight-forward dishes to the diner and leaves it to them to add variety, interest, and pleasure from among a variety of sauces placed on the table for that purpose. In the late 1800s, a new kind of sauce was introduced in Japan. Simply called so-su (spelled ソース using Japan’s katakana alphabet to denote foreign origin), it was inspired by the brown sauces of Europe and America that appeared in those regions earlier in the century, such as Worcestershire sauce, steak sauce, and ketchup. They, in turn, had been inspired by the brown sauces of Asia—fish sauce, oyster sauce, kecap, chutney, and soy sauce. This round-about culinary migration reflected the rise in global trade and the globalization of cooking and eating that had started earlier in the century, with Japan coming relatively late to the table because it had been closed to outside influences until the fall of the Tokugawa Shogunate in 1868. So-su quickly became a staple of the Japanese pantry, adapted to local ingredients and local tastes. A complex fermented sauce, it is typically made with a base of vegetable and fruit purees plus rice vinegar, katsuobushi, kombu, spices, sugar, and salt. It was considered a new type of soy sauce, with less intense umami, half as salty, and tangier (although not as acidic as citrus juice and rice vinegar), giving it a better ability to complement Japan’s increasingly rich, internationalized dishes. It also had the added flavor dimensions of sweetness, smokiness, and viscosity and the exotic quality of foreign spices. Most important is the beautifully fragrant aroma of so-su, something not matched by Japan’s classical sauces. So-su soon became the mother sauce for a family of other brown sauces—chuno (a medium-thick sauce), tokuno (a thick sauce commonly referred to as tonkatsu sauce), and a variety of tomato sauces—all of which vary by degrees in terms of their sweetness, fruitiness, spice, and ability to coat foods. Originally used for foreign foods, like fried, meat, and Asian dishes, they are now creatively used in Japan in all kinds of cooking and for finishing foods at the table, including rich, oily sashimi. 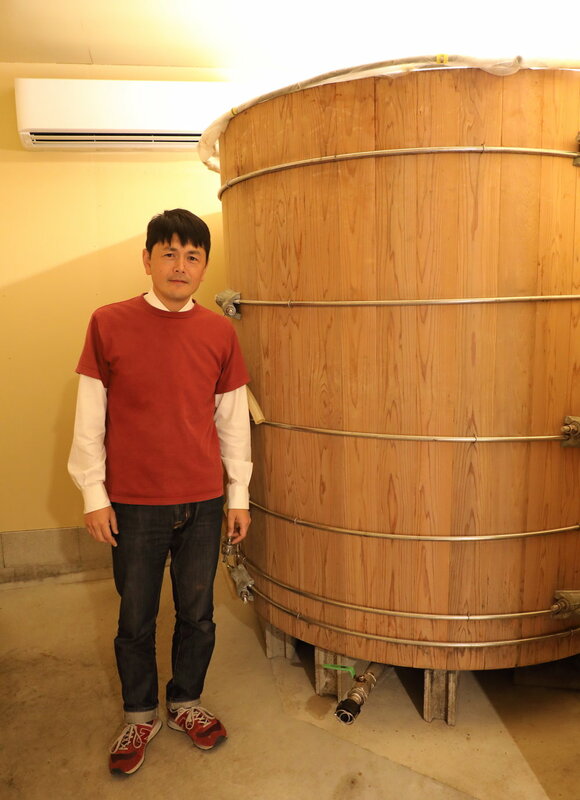 Daishi Torii standing next to one of the large kioke wooden barrels he uses to brew and lightly ferment his sauces. The Torii family of sauces. The red-labeled bottle on the left is Torii’s usta so-su. Proceeding to the right are: chuno so-su, kanjuku so-su, ome-rice so-su, spice so-su, and okedoko no chikara so-su. Estabished in 1924 by Daishi’s grandfather, Torii Sauce is located in Hamamatsu, the largest city in Shizuoka prefecture. Shizuoka encompasses a long stretch of land along the Pacific Ocean roughly midway between the cities of Tokyo and Nagoya and extends inland to Mt. Fuji and the Southern Japanese Alps. Blessed with more open land than most places in Japan, as well as a sunny, temperate coastal climate and mineral-rich volcanic soil, it is one of Japan’s three great agricultural regions alongside the islands of the Seto Inland Sea and the plains of Hokkaido. The fertility of the area contributed to the power of Ieyasu Tokugawa (1543-1616), whose home base was Hamamatsu Castle. He founded the Tokugawa Shogunate (1600-1868), during which Japan’s food culture became more oriented to rich fermented foods and dishes made with deeper and more layered flavors. With the opening of the country in 1868 upon the downfall of the shogunate, Shizuoka continued to lead the country’s cuisine in new directions and became a major growing region for new kinds of Western vegetables, including umami-rich tomatoes, yellow onions, celery, garlic, and hot peppers. It is particularly famous for its tomatoes. Torii Sauce operates out of three small buildings clustered together on the outskirts of Hamamatsu. It continues to be a small family business. In fact, it seems like a large busy kitchen given the stocks of ingredients lining the buildings’ walls and the bustle of its fifteen staff, prepping vegetables, fermenting vinegar, and boiling and steeping sauce. 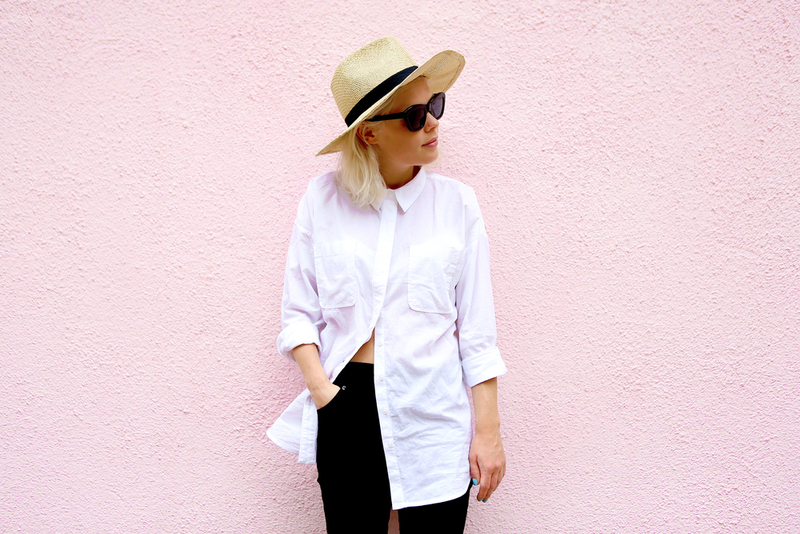 Daishi took over the business fifteen years ago in 2003 at the young age of thirty-four. While continuing family traditions, he has worked to perfect the recipe for Torii’s usta so-su. He makes a better quality product than the large producers who often use cheap, foreign vegetables (and less of them) and who take shortcuts using artificial ingredients and preservatives. In addition, large producers, and also other artisanal brewers, tend to make simpler products that have strong hits of flavor—tangy, spicy, or thickly textured. Instead, Daishi’s usta so-su has the consistency of the delicate juiciness of its vegetables and a natural richness and depth of flavor produced by layers of ingredients. There are many more types of vegetables in his sauce, five sources of umami, three types of acid, two types of vinegar, a global pantry of aromatic spices, two types of sugar, and both caramel and smoky aromatics. Make a puree of locally-grown onions, tomatoes, carrots, celery, and garlic harvested at the peak of their flavor. (Daishi uses Momotaro tomatoes because of their perfect balance of sweet and tangy flavor and ability to hold up to cooking.) First steam-boil the vegetables without peeling them so that they retain all of their nutrients and flavor. Then mash them into a fine pulp using a traditional ishi-usu stone grinding mill. Next add two kinds of rice vinegar made from sake kazu (the lees leftover from making sake) because of its deep umami. One vinegar should be made from fresh sake kazu. For the other, age the sake kazu for two years until it develops even more umami, becomes milder and sweeter, and acquires a dark chocolatey color. Daishi gets his sake kazu from local sake brewer Hana no Mai Shuzo, which like Torii Sauce is committed to using high-quality, local ingredients and traditional processes. One of Hamamatsu’s oldest sake breweries, Hana no Mai Shuzo makes its sake with Yamada Nishiki rice, Japan’s highest quality sake brewer’s rice, and pure spring water that flows underground from the nearby Akaishi mountain range of Japan’s Southern Alps. 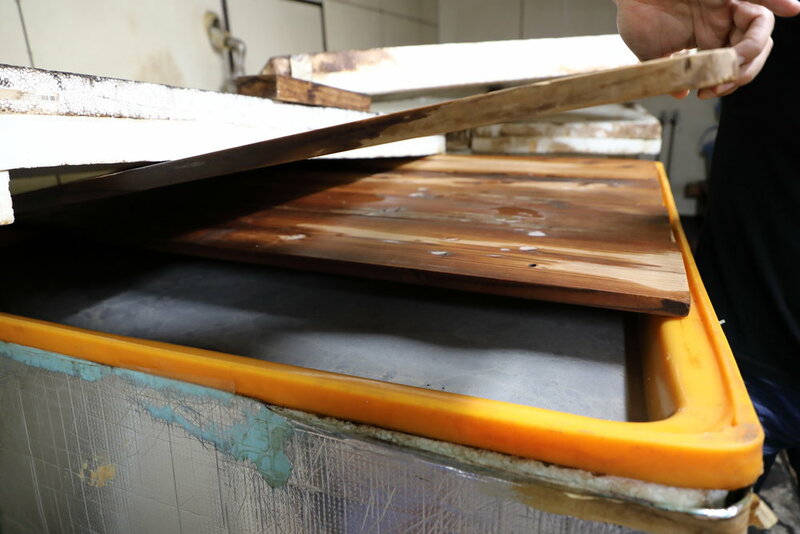 Now, add a type of katsuobushi called arabushi and a type of kombu seaweed called ma-kombu. Arabushi is preferred because it retains a distinct smokey aroma and flavor. 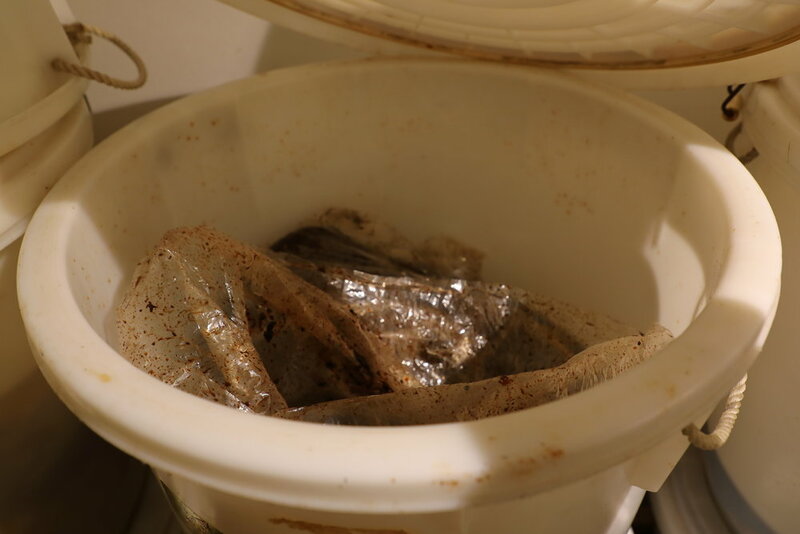 Ma-kombu is used because it is slightly sweeter than other kombu, like rausu-kombu, which tends to be slightly bitter, and rishiri-kombu, which can be too salty. For the best results, get the arabushi made in Ibuseki in Kagoshima prefecture and the ma-kombu from Hakodate in Hokkaido. Put whole and broken pieces of cinnamon from China, cloves and nutmeg from Indonesia, black pepper from Malaysia, red pepper from Turkey, and sage, thyme, bay leaf, and fennel from Europe’s Mediterranean countries into cotton bags and steep them in the sauce for three to four days, gradually reducing the temperature from 80 to 60 degrees Celsius. Do not use ground spices or add the spices directly to the sauce, as some sauce makers do, because you will get a gritty texture and medicinal taste. Burn some white sugar and add that to the sauce for natural caramel coloring and flavoring and also a slight bitterness. Season the sauce with raw brown cane sugar from Tanegashima Island, salt, and lemon juice to round out its flavor. Let the sauce rest in a pot for about a week. Then drain the liquid from the sediment at the bottom and put it into large kioke wooden barrels and ferment it for up to two months. This relatively short period is preferred because it keeps the sauce light and fresh-tasting. Also, there is enough natural umami in the sauce from its ingredients, and so no more is required from a long fermentation. Put the sauce into bottles. It will keep for a long time because of the natural preservation from the acids, salt, and sugar in the sauce. Torii Sauce’s “prep cooks” use air guns to blow the skins off the onions used in its sauces. Large, pink Momotaro tomatoes are used in all Torii sauces. They are both sweet and tangy, as well as full of satisfying umami. The vegetables are layered in large cauldrons, with the ones on the bottom being boiled and those on the top getting steamed. Fresh sake kazu (sake lees) makes one type of rice vinegar used in Torii’s usta so-su. Sake kazu that has been aged for two years until it develops a deep umami, milder and sweeter flavor and dark chocolatey color is used to make a second type of rice vinegar used in Torii’s usta so-su. Whole spices are gathered from around the world, like this piece of cinnamon from China, and are then steeped in the sauce to give it a beautifully spiced aroma. Torii’s usta so-su is used in all kinds of applications. It often appears at restaurants as a dipping sauce alongside salt and a wedge of lemon to brighten and accent fried foods, like fried oysters, deep-fried kushiage skewered meats and vegetables, korokke potato croquettes, and deep-fried tonkastu pork cutlets. It is also used for noodle, stir fry, and other Asian dishes as an integrating base liquid that enhances their aroma, deepens their color, accents their flavor, and increases their umami. As a rule of thumb, usta so-su is thought of as a sweet-sour seasoning anchored by umami, used when cooks want to brighten and enrich a dish composed of a medley of ingredients, and is added to soups, stews, curries, and meat loafs. It is also used in marinades and other sauces like demi-glace and barbecue sauces. Often it is used together with soy sauce, with the usta so-su providing sweetness and acidity and the soy sauce amping up the umami. This combination works well because Torii’s usta so-su is only 10% salt compared to 15-18% for soy sauce. In other words, a tablespoon each of usta so-su and soy sauce adds less than a teaspoon of salt to a dish, while providing lots of other flavor benefits including the dissolved aromas of spices and smoke. Daishi, himself, uses his usta so-su as a base and foundation for several other unique and delicious sauces. Chuno So-su: Chuno means medium-thick, and Torii’s chuno so-su has a consistency between its usta so-su and the thick, syrupy tonkatsu sauces found in Japan. 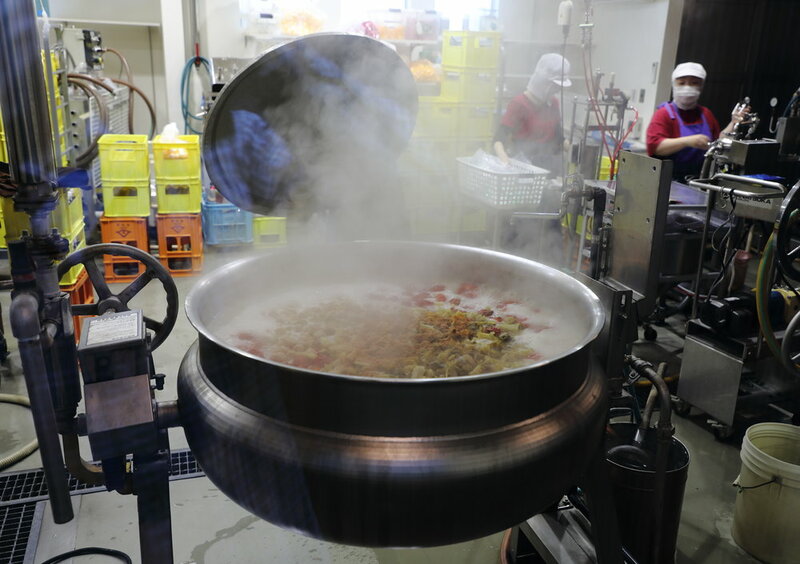 Torii’s usta so-su is the base of the sauce, accounting for 20% of its ingredients. To this Daishi adds pureed apples, more vegetable puree, allspice, and cumin. While the fruit and vegetable purees give the sauce most of its texture, he thickens it with powdered rice to get just the right light-bodied and beautiful pouring consistency. Powdered rice is tricky to work with because of the vinegar in the sauce, but it produces a silkier texture and healthier sauce than the corn starch and molasses used by other makers. Chuno is sweeter and milder than Torii’s usta so-su and has the delicious taste of its apples and vegetables. It can be used for all the same purposes as usta so-su; in particular when you want to add body to dishes and coat foods as a topping. It is a classic topping for okonomiyaki pancakes, takoyaki octopus balls, and yakisoba noodles. 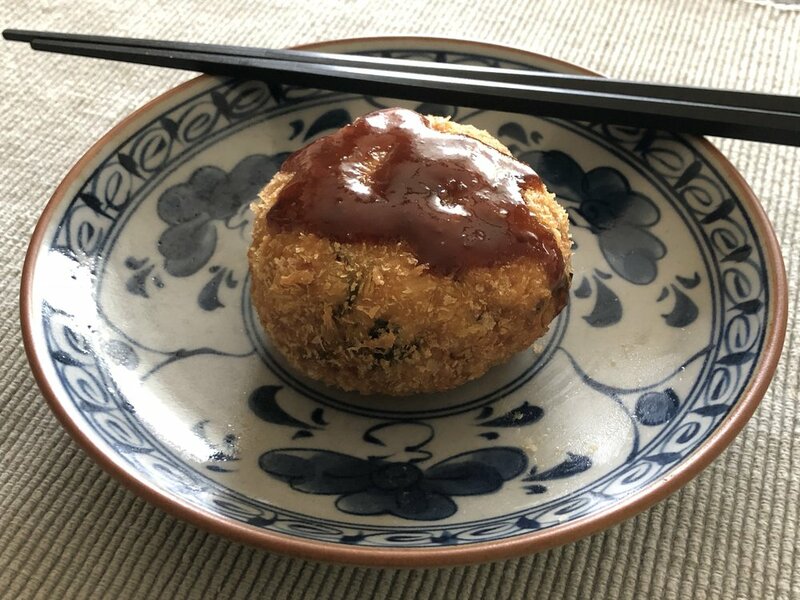 Torii’s chuno so-su gracing a korokke potato croquette. Kanjuku So-su: Kanjuku means ripe and juicy. This sauce is virtually the same as Torii’s chuno so-su but made without katsuobushi, making it a fruit and vegetable sauce and technically a vegan product. Lighter colored and with less intense umami, it is a delicious topping for eggs, cheese, pate, chicken, turkey, pork, and duck. It is a great substitute for mayonnaise on sandwiches and other uses if you want to avoid eggs and oil. It can also be a base for salad dressings and as a kakushi-aji (secret ingredient) in cooking and making other types of sauces. Ome-Rice So-su: Ome-rice is a Japanese dish consisting of an omelette over fried rice with a slick of tomato sauce (usually ketchup) on top. Torii’s ome-rice so-su is made similar to its usta so-su but with many more tomatoes and the additions of apples and shiso (perilla) as a minty-basil accent. Its thin consistency makes it easy to use in cooking. It is often combined with usta so-su and soy sauce when sweetness is needed to round out a dish. It is great in Bloody Mary’s. Like Torii’s kanjuku sauce, it is made without katsuobushi. Spice So-su: Another variant of Torii’s usta so-su, this sauce has more viscosity, more tomatoes, more spices, and the addition of apples. It also incorporates locally-grown habanero peppers to create a sauce with heat. Daishi recommends using it in curries, udon noodle soups, and red sauce pasta dishes and as topping for any number of dishes. 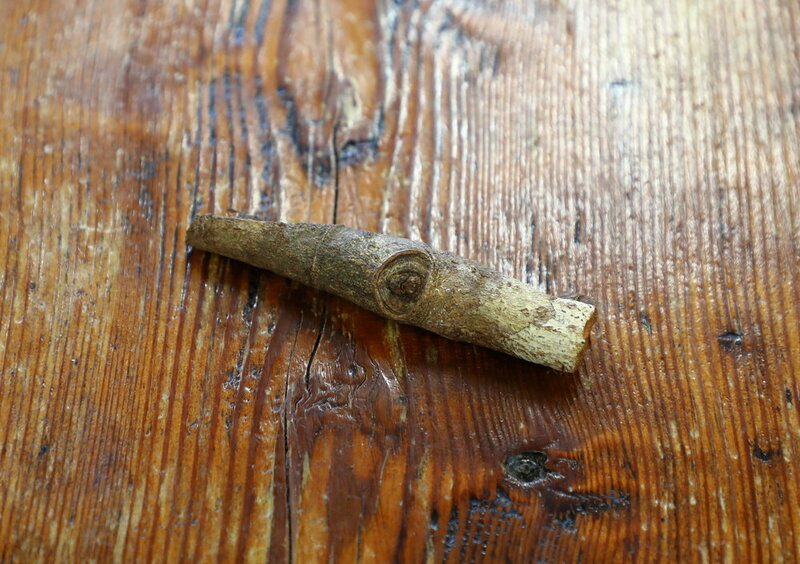 Spice so-su is also made without katsuobushi. Okedoko no Chikara So-su: This is a recent addition to the Torii family of sauces. Okedoko no Chikara means the power of the bottom of the barrel, and this sauce is the richer, spicier bottom layer of usta so-su after the rest has been drained from the kioke wooden barrels. It is meant to be a fortified base sauce for cooks to use to make their own sauces, such as marinades, dipping sauces, and BBQ sauce and as a rich ingredient in cooking. 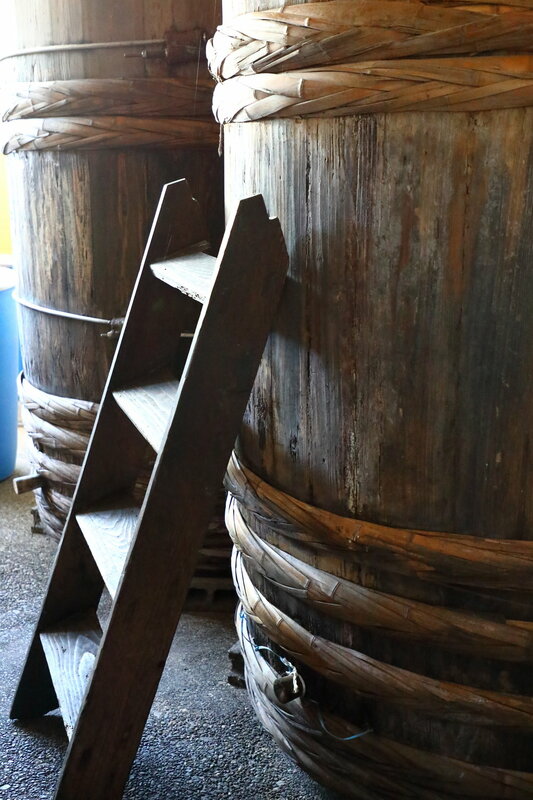 The deep, rich-tasing Okedoko no Chikara so-su that comes from the bottom of the large kioke wooden fermentation barrels is a foundation sauce one can use to create your own delicious sauces. The shop at Torii Sauce is open from 9:00 to 17:00 Mondays through Fridays. It offers tastings as well as tours if you call in advance. Large groups of a minimum of 10 people can arrange to be taken through the whole process of making sauce, including bottling a sauce to take home with them. Owner Daishi Torii is fluent in English. 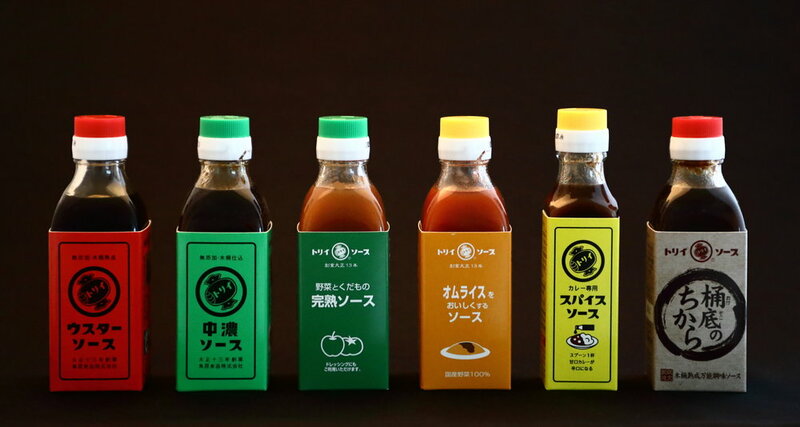 Torii Sauce sells its products through its online shop. They are also widely available in supermarkets in Shizuoka prefecture. In Japan’s big cities, you can find Torii sauces at department stores and specialty food stores like Dean & DeLuca. Daishi Torii explaining the process of making his sauce to visitors. Torii Sauce is easily reached from the JR Hamamatsu Station, which services the Tokaido Shinkansen and the Tokaido Main Line. From the station, it is around 5 minutes by cab, 10 minutes by public transportation, and 15 minutes by foot. If you are arriving at the Shin-Hamamatsu Station, which services the Enshu Railway, the times by cab and public transportation are the same. It takes 5 minutes more to get to Torii Sauce by foot. Shizuoka prefecture has many different types of soil, which is evidenced by different colors. In addition to being one of Japan’s leading agricultural regions, Shizuoka is a recreational area, and includes the spectacular Izu Peninsula and its famous hot springs resorts, like Atami and Itoh, and the historic town of Shimoda, where Commodore Perry landed in 1852 and opened Japan to American trade. Mt. Fuji and Lake Hamanakako are other famous features of the prefecture. 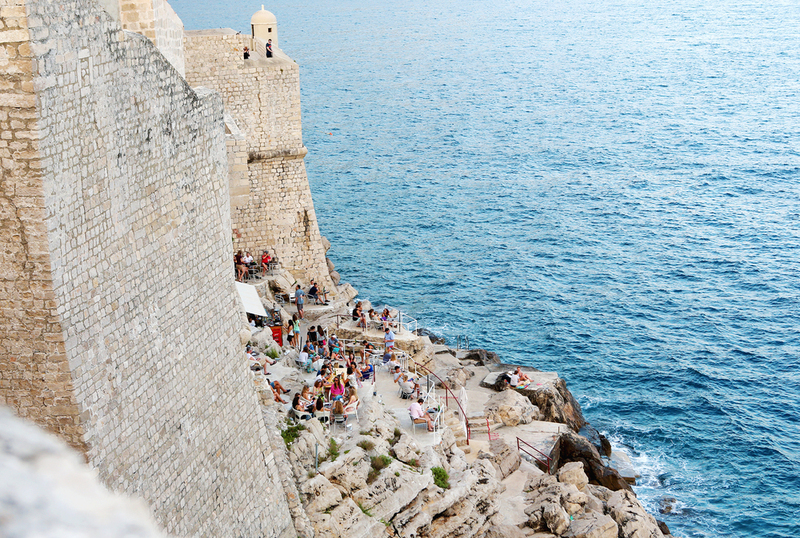 It is also a food lover’s paradise that brings together great seafood caught off its long coastline and all of the delicious produce grown inland. Food specialities range from the elaborate kaiseki multi-course meals served at the region’s ryokans and hot springs resorts to the hearty comfort food dishes of gyoza dumplings, yakisoba noodles, and okonomiyaki pancakes enjoyed by local workers. In recent years, many new farm-to-table restaurants have opened, which showcase the region’s foods in straight-forward and creative ways. Ryo Imazu at the entrance to his restaurant 農＋NOTICE located in the middle of his farm in Shizuoka prefecture. Opened a year ago, 農＋NOTICE is an amazing place, unique in many ways, including being a table-in-a-farm restaurant. 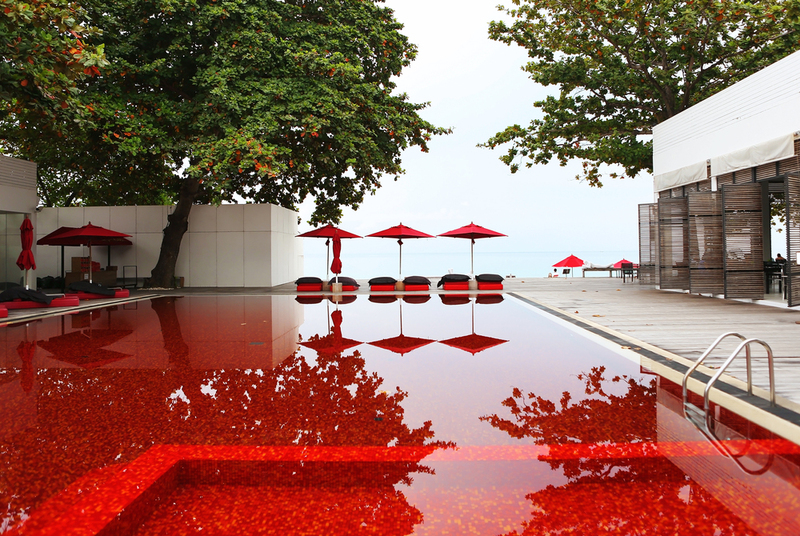 It is housed in a simple, sunny structure that farmer-chef Ryo Imazu built in the middle of his extensive fields. Before becoming a farmer seven years ago, Ryo worked at restaurants in Tokyo, and his talent at growing big, beautiful, and tasty vegetables is matched by his ability to turn them into delicious and unique dishes. Ryo harvests them in the morning before the sun comes up when they are at the peak of their flavor. But during your meal he may walk out to the fields to pick something not on your menu or gather the plants’ edible flowers for you to try. Ryo’s passion for what he does, the beautiful colors of his dishes, and the touch of whimsy in their presentation make eating at 農＋NOTICE a joyful experience. Ryo in the fields directly outside of the restaurant picking the dried pods and fresh flowers of okra to offer to guests to taste during lunch. The restaurant is open Tuesday, Thursday, Friday, Saturday, and Sunday. At lunch, Ryo serves a three-course meal, consisting of two bento boxes of vegetable appetizers, a choice between a meat or seafood main dish, and dessert, coffee and tea, for ¥2,480. The tea is kuromoji-cha, a traditional herbal tea made from the leaves and twigs of spice bushes. There is also a more elaborate lunchtime course menu for ¥4,500 plus a la carte options. The restaurant is open at night for dinner, and reservations made at least three days before are a must. For dinner, Ryo offers two types of multi-course meals for ¥3,990 and ¥6,500 plus a la carte options. The tricky thing is that the restaurant is somewhat remote. It takes 40 minutes by car to get there from the center of Hamamatsu city. Another way to get there is by getting off at the Hamamatsu Service Area if you’re driving along the Shin-Tomei Expressway. The restaurant is only 4 minutes from the exit of the service area. In the lunch box on the left starting from the left top corner and going clock-wise: Shadow Queen purple sweet potato with roasted green pepper and seasoned with dashi, sake, soy sauce, and mirin; potato tofu smothered in an okura and green pepper paste and seasoned with sanbaizu jelly; mizu-nasu eggplant and okura seasoned with sour plum vinegar and topped with miyoga and shiso; and roasted naga-nasu eggplant topped with sweetened dengaku miso. In the lunch box on the right starting from the left top corner and going clock-wise: green omelette made with a puree of long beans; roasted mangaji-togarashi peppers seasoned with dashi, soy sauce, and katsuobushi flakes; okura rolled in pork belly slices and pan-fried in miso; and a puree of kabocha pumpkin on top of a bed of roasted red pepper and topped with charred pieces of pumpkin skin. A main dish of roast pork and roasted kabocha pumpkin, habanero peppers, eggplant, okura, manganji-togarashi peppers, and long beans. The dessert on the left is a light, airy panna cotta topped with a chocolate crumble made to look like earth. On the right is a tiramisu made with matcha green tea and served on a hand trowel.